Patricia’s work is focused on service- to her clients, prospects, and business associates. Her career intention is to serve the greater good with her God- given abilities and training to build a better world for her children, their peers, and the generations to come. Raised in Monroe, Wisconsin, on her parent’s dairy farm, Patricia learned the values of diligence, smart work and patient persistence. After graduating from Monroe Senior High School, she received a scholarship to Cardinal Stritch University where she graduated in four years with a Bachelor’s in Business Finance, earning the Gold Key award, given to the graduate of highest scholarship. Since then, Patricia has spent her career in the financial industry in the areas of banking, insurance and tax preparation before affiliating with her current office in 2002. 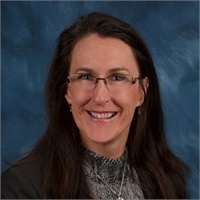 Residing in the Kettle Moraine with her husband of over 25 years, Joseph, and their four children, Patricia enjoys hobbies of distance cycling, reading and spending time with family and friends.